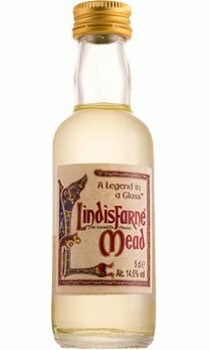 Lindisfarne Mead is a unique alcoholic fortified wine manufactured here on the Holy Island of Lindisfarne. The honey which is used in the production of Lindisfarne Mead is drawn from the four corners of the world and here, on the island, it is vatted with fermented grape juice, honey, herbs, and the pure natural water of an artesian well and fortified with fine spirits to produce this unique drink. Lindisfarne Mead is produced exclusively on the Holy Island of Lindisfarne, situated off the Northumbrian Coast. This island is the "Cradle of Christianity" in England, for in the year 634 A.D., Oswald, King of Northumberland, brought St. Aidan from the island of Iona to establish a monastery here. The motifs illuminating our labels are drawn from Bishop Eadfrith's magnificient Lindisfarne Gospels written circa 700 AD., which, with the Books of Durrow and Kells, remain a living testimony to the devotion and love of beauty and culture which existed in those distant times.